I was visiting Baltimore with my wife the other day. We were waiting at the bus stop for the shuttle to take us back to our hotel. When he arrived at the bus stop no one approached him for his autograph. No one sought any pearls of wisdom. No one wanted his Twitter name or if he had a Facebook page. He didn't look to be a man of means. He wasn't a thought leader, author, or professor (at least not by appearance.) He was a simple man. Long beard, long hair, tall and lanky. Old pants and a worn leather jacket. He moved slowly and was considerate of those around him. He had a kind look on his face. It was clear this was just another routine: go to the bus stop trash and seek out an unfinished lunch or a half eaten piece of fruit. He didn't seem resentful. He simply went about his business. Not saying a word, he found a small white bag, opened it and found a small treasure. Lunch is served. Meanwhile I stood there waiting for the shuttle and stole glances in his direction. Earlier, I had eaten a crab cake sandwich and bowl of crab bisque for MY lunch. I ate it outside in the warm sun enjoying the company of my beautiful wife. We had sat at a quaint table surrounded by flowers and smiling wait staff. But now, this was my homeless moment. Have you ever had one of these? Afterward on the shuttle, my mind raced (it still races today). I was brought up to help people. I learned that there will always be people better off and worse off than me. But I froze that day at the bus stop. I didn't offer any help. Why did I freeze? Why didn't I do something? The answer is quite simple. I wasn't prepared. I was engrossed in me and my wife (not a bad thing in itself, just incomplete). I consider this moment a test of my character. We are all stewards of opportunity. How we seize a moment lies not in the moment itself but in the preparation ahead of the moment. This homeless moment revealed to me my inadequate time alone with God in preparation for times like these. One could argue I was sort of homeless myself - not truly at home in Christ. My commitment to everyday giving demands this kind of preparedness. Would the homeless man have responded to my offer for lunch if I had been prepared? Doesn't matter. It would have been mine to obey. Period. The results are not for me to claim. Looking ahead: Will I respond to the next homeless I see? You bet. Will I offer lunch? Maybe, maybe not. It may simply be a handshake. A smile. Or maybe I will embark on a conversation, give some cash, or point to a shelter I know about. It's God's role to work through me. It's my role to be prepared. What about you? Are you prepared to give? My wife and I recently went to Chipotle for dinner. If you're not familiar with this restaurant, it's a fast food place where you can get burritos the size of a small country, packed with rice, beans, chicken, and so on. I added a picture to this post. While eating, I noticed writing on my cup. It informed me of a person by the name of Wes Jackson, a plant geneticist who transforms agriculture by cross-breeding traditional, annual food crops like wheat, sunflowers and corn with deep-rooted perennials. This can possibly lead to diminishing the need for pesticides, herbicides and fertilizers. It can also help save water, reduce erosion, and replenish the soil. He founded www.landinstitute.org. He is quoted as saying "if your life's work can be accomplished in your lifetime, you're not thinking big enough." What a great quote to use to re-align ourselves at the beginning of a brand new year! How are YOU going to give this year? Does your giving lead to something bigger than you are? Why not let this year be the best ever? There are many ways to give back and make the world a better place. One way is to share your faith. On day 24 of the Twenty Five Days to Make a Difference project, Laura shares with us her Christmas Eve prayer. You need to click here and experience it now. Christmas means much more to me than decorations, parties, and the giving and receiving of gifts. It is the celebration of the birth of Jesus, who came from Heaven to save the world. Would you like to share your spiritual faith with others? Start right here and right now by leaving a comment on this blog post and let readers of the Everyday Giving Blog know about your spiritual beliefs. Note: Feel free to respond to comments left by others. All I ask is that you are respectful. Roger has asked me to post on my family's recent mission trip to Jamaica. "Jamaica!? ", you ask, "Isn't that where newlyweds go to sit on the beach and self indulge at one of those all-inclusive resorts?" Well, that's only part of the island. 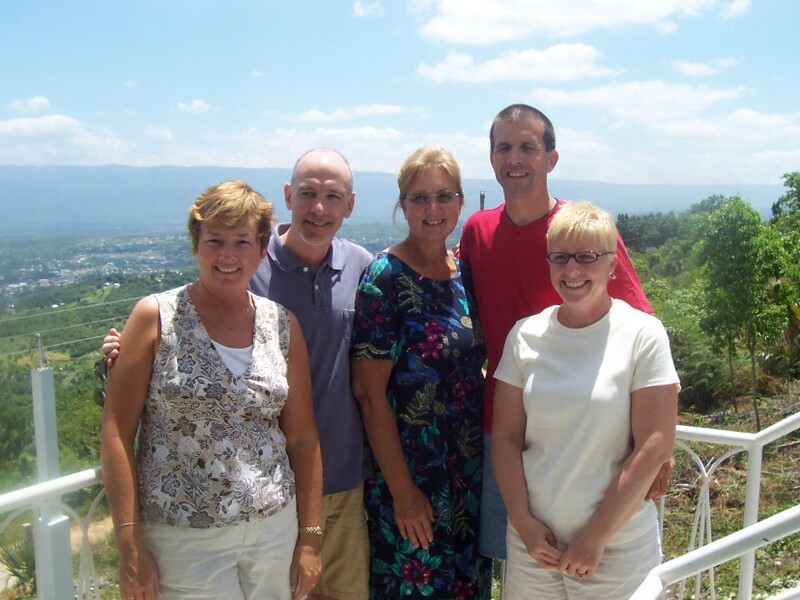 We have a friend, Karen, who has discovered God's call on her heart to serve the poverty-stricken and less-than-healthy people on the hillside above Santa Cruz, Jamaica. She has taken the proceeds from the sale of personal property in the states to build a house right on the hill in the midst of the people. She returns to the states periodically to earn what she can to support her mission work. We went with another family, the Carter's, to help her build a basketball court and swingsets. While there, we also planned and held both a Bible Club and basketball camp for the children. We were able to minister in a little church on Easter Sunday singing and doing puppets for the children. It was an unbelievable display of how God worked using the talents He gave each one of us. 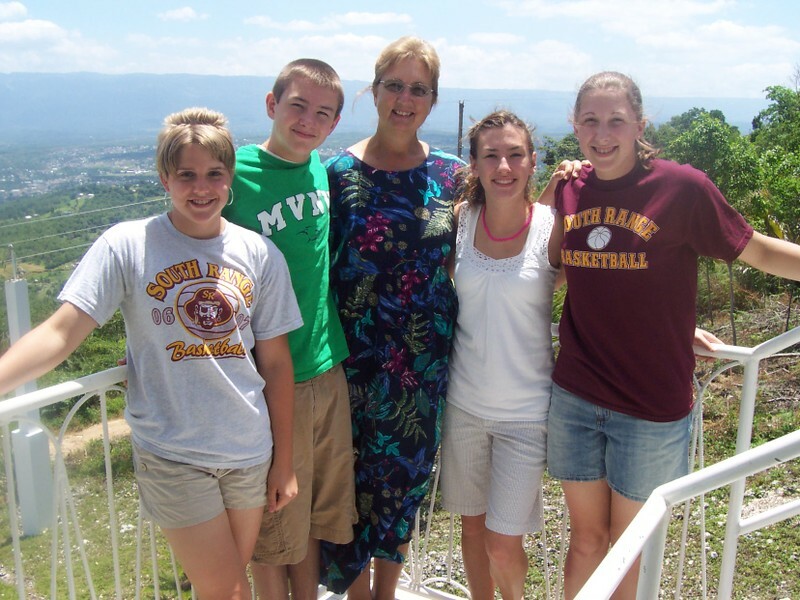 It was especially pleasing to serve alongside my wife, 2 teenage children, and close friends. There is so much more I could share about the trip (the potholes, one-lane roads, farming by hand in rocky soil, eating all parts of goat, getting drinking water from a pipe coming up out of the ground, cold showers with no water pressure) but the most amazing thing that I learned was that IT WAS POSSIBLE. I always thought overseas mission work was for those who were properly trained and certified and officially sent by an established organization. And I'm sure that's also helpful to maintain a consistency and, in some cases, security. But if the funds are available, it's just a matter of a flight and bus trip and we're back on the hill doing ministry! Like flying to San Antonio and then driving to Dallas. This means that for anyone reading this post, YOU can make a difference. Even if it isn't overseas. YOU have gifts. YOU have talents. They can be used to make someone else's life a little better. A word about giving: We were able to go, in large part, because of the generous giving of others. In a way, they went with us. Because of them, we were able to obtain the flights, basketballs, Bible Club balloons & crafts, and even a keyboard for Karen! So, even if you think you couldn't actually make a trip to minister somewhere, consider funding someone who is already on a mission field. We can all be part of making the world a better place! The 1st pic is of Karen with the Couchenour and Carter kids. The 2nd pic is Karen with the adults. I currently serve as VP of Operations in a company that helps churches create the right ministry space (Cogun, Inc.). I am also owner of Serving Strong, a life balance resource and coaching service to people who help people. Last night I interviewed Kerri Cartelli. She is the author of What a Difference a Day Makes: A Survival Guide for Women . Go to http://www.everydaygivingradio.com/2006/10/interview_with_.html to listen to the full interview. I will be writing up a more extensive post for this blog regarding the interview, but I didn't want you to have to wait another minute to hear what she has to say. I was doing some research on my computer this morning and discovered a blog that got my interest. It was by a Christian youth group that traveled to Washington DC this past week. They made the trip to help others in a variety of ways while also finding opportunities to share their faith. You can check out the "One Step Closer '06" blog at http://onestepcloser06.blogspot.com. Make sure you submit a comment of encouragement to them while you are reading their posts. There are many other youth groups just like this team that are unselfishly giving their time for others. It is great we have parents, teachers and leaders that teach the importance of giving and encourage our youth to put it into practice. It was clear to me that this group of young people didn't take the time to help because their parents made them go. They were enthusiastic to go and do what they could for others they didn't even know. Doesn't that give you hope for the future? Doesn't it encourage you to find other ways you can give to others? It should! We already have a couple of great interviews ready for you to listen to. One interview is with a terrific lady I met at Book Expo America this month. Cindy Katz has started a company called Plant A Tree USA. She has a very big goal to benefit the world that she is pursuing. She has already made significant progress towards meeting that goal. The second interview is with a young boy and his mother. Cole Hodges and Joan Crown are the co-founders of Donate Your Birthday. Cole has been donating his birthday since he was five years old. Cole and his mom have now set up a nonprofit organization to encourage others to do the same. Check out the interviews at http://www.everydaygivingradio.com. Be sure to leave a comment on the website to let me know your thoughts on the interviews. I am also interested in knowing what you liked, what I can improve on, and topics you would like covered in future interviews. Note: If you prefer to download the mp3 files of the interviews to your portable mp3 player, like I do, it will be easier to sign up for the Everyday Giving Radio podcast at http://feeds.feedburner.com/EverydayGivingRadio.